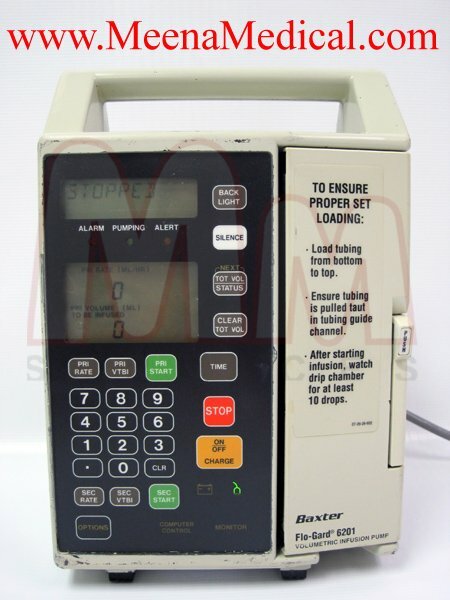 The Baxter Flo-Gard 6201 Volumetric Infusion Pump can deliver a wide variety of fluids over a broad range on infusion rates. Configurable settings to allow the pump to be custom tailored to best suit the hospital's needs. 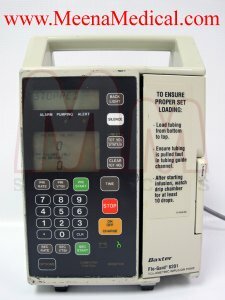 Computer control capability allows remote control or monitoring of the unit via a standard RS232-C interface. Pumps a wide variety of fluids, including blood and fat emulsions. Suitable for epidural administration. Occlusion sensors detect both upstream and downstream restrictions. Ultrasonic air-in-line detector. Programmed Delivery Profile allows up to 10 steps, individualizing control of infusion ramping and tapering. Automatic Restart once occlusion clears. Automatic Piggybacking of secondary medications. Battery/Time 12 volt, 2.0 ampere, sealed lead acid Battery Recharge 80% charged within 8 hr. Battery Life 6 hr at l,400 mL/hr. A 10% Restocking Fee will be applied in Failure to provide the copy of the Prescription.